The journey into Milford Sound is equally as impressive as the destination itself, with stunning lakes, waterfalls, dense rain-forest and snow-capped mountain ranges around every corner. If you’re wondering how to get from Queenstown to Milford Sound, consider bus and coach options. Travelling on a Milford Sound bus or coach tour is stress-free and easy on the wallet, with a range of options to suit every traveller. 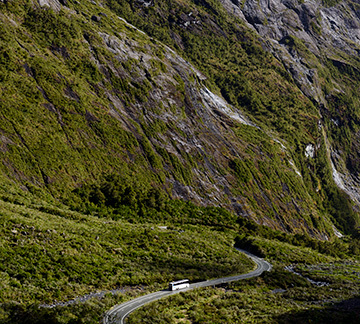 If you choose to drive to Milford Sound, it’s fair to say you’ll miss a lot of the dramatic scenery along the way. Catching the bus to Milford Sound is the easiest way to get there, as you can relax in comfort, gaze out the window and admire the incredible views. You can feel safe with a Milford Sound bus driver – they’re all locals who are experts at driving through the mountainous highways and in wet, snowy or icy conditions. There are many operators offering coach tours to Milford Sound. GreatSights, Gray Line, and awesomeNZ all offer exceptional service and include a spectacular sightseeing cruise on the fiord. Milford Sound coaches are scheduled to arrive at the fiord right before the Milford Sound cruise boats depart, so you can relax on board without worrying about whether you’ll get there in time for your cruise. When you catch a Milford Sound coach you’ll be entertained along the way with commentary from an experienced, lively, local guide. You’ll learn all about the history and geography of the area, about Māori and New Zealand culture and the wildlife in Fiordland National Park. What’s more, Milford Sound tour guides know the best scenic spots to stop at on the journey to Milford Sound. These photo stops allow you to stretch your legs, inhale the crisp clean air and most importantly, capture some memorable photographs! 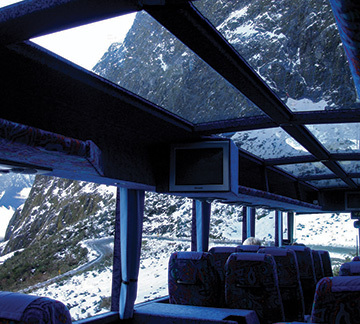 Milford Sound coach tours generally include coach travel (some in a glass-roof coach so you don’t miss the stunning alpine views along the Milford Road) and a cruise on the fiord. Travelling by coach is the easiest and most cost-effective way to see one of New Zealand’s most naturally beautiful destinations. If you choose, you can book a scenic flight for your return journey to Queenstown. Read more about coach tours to Milford Sound. If you’re an independent traveller making your way around New Zealand, you can book one-way or return bus travel to Milford Sound with InterCity, who operate NZ’s largest bus network. Buses to Milford Sound depart every morning from Queenstown and Te Anau, arriving in Milford Sound around lunchtime. Return journeys depart in the afternoon and arrive in Queenstown in the evening. Buses to Milford Sound are timed to coincide with cruise ship departures, but you can also bus to Milford Sound if you’re planning to stay there for full-day activities like kayaking or diving. If you need transport from Milford Sound after completing the Milford Track, catching the bus is a good solution as there’s plenty of storage on board for your pack. InterCity also offers a popular range of New Zealand bus passes for travellers on a budget. FlexiPass is the most popular and used by students, backpackers and regular travellers alike. The pass is based on hours of travel and provides access to the entire national network of InterCity’s services. You can also use FlexiPass to book sightseeing day trips to all the main attractions, including Milford Sound. Another popular transport pass is the TravelPass. This provides nationwide bus travel on pre-planned routes, including bonus day tours. InterCity bus passes are valid for 12 months and give you the freedom to decide where you want to go and travel at your own pace.